The Karnataka government has ordered an SIT probe into audio tapes that name everybody from the state Speaker to BJP chief Amit Shah and even the PM. Bengaluru: Karnataka Chief Minister H.D. Kumaraswamy Monday announced in the state assembly that the government will constitute a Special Investigation Team (SIT) to probe the audio tapes in which BJP leader B.S. Yeddyurappa is allegedly professing to topple the Congress-JD(S) government. Kumaraswamy made the announcement after an emotional Speaker, Ramesh Kumar, who has been named in the tapes, raised the controversy suo motu, saying it was an attempt to malign the Speaker’s chair and cast aspersions on his character. “The statement made by a person who holds a very responsible position in this assembly claims that I, Ramesh Kumar, has been given Rs 50 crore to immediately accept the resignations of legislators who submit them,” Kumar said in the assembly, adding that it makes it difficult for him to honour the Speaker’s position with such allegations as it may come across that he could be easily “bought”. “The audio tape also says that if that does not happen, the situation will be further managed. I have also heard the name of the PM being taken in it,” he further said. The tapes, released to the media by the CM on 8 February, came in the backdrop of seven Congress MLAs being holed up in a Mumbai hotel for several weeks. The MLAs are disgruntled with the Congress for denying them plum posts such as ministerships and chairmanships of boards and corporations. One of the tapes is purportedly a conversation between Yeddyurappa, Devadurg MLA Shivangouda Naik of the BJP, and Sharanagouda Kandakur, the son of the Gurmitkal JD(S) MLA Naganagouda Kandakur. The other tape is allegedly a conversation between Shivangouda and Sharanagouda Kandakur. They are allegedly discussing the BJP’s efforts, dubbed Operation Kamala 3.0, to topple the coalition government in the state by getting ruling party MLAs, particularly from the Congress, to resign. B.S. Yeddyurappa (BSY): Come sit, sit. BSY: What do you do now? Sharanagouda (MLA Gurmitkal’s son): Sir, I do this (politics) full time. BSY: No no. What job do you do? Sharanagouda: Sir, I am involved in politics full time now. Shivangouda Naik (BJP MLA): Sir, full-fledged politics is what he means. He manages the entire constituency himself. He takes care of everything when his father is not available. Shivangouda Naik: Sir, how is your health? Shivangouda Naik: We got to know that you were in Devadurga (in Raichur district). BSY: What is your father’s age? BSY: Will you stand(for elections)? Sharanagouda: Sir, I don’t know what will happen. BSY: Tomorrow if everything is fine will you stand? Sharanagouda: Sir, I have made no such decision. I am yet to decide. Shivangouda Naik: No, he is asking if you will stand for elections or your father? Sharanagouda: Sir, it depends on what the situation would be like. BSY: Nothing will happen. Don’t worry. In the next four days, everything will be over. You can become a minister and move on. We don’t have anybody there (in Kalaburagi and Yadgir districts). There will not be any problem for us to make you a minister. We will manage here and there whatever happens. Shivangouda Naik: Sir, he is a very dynamic leader. In his constituency, he is a very good leader. BSY: We have two issues. One, we do not have anyone there; secondly, it is very difficult to make anyone a minister here. So if you say you will stand, instead of your father, it will be easier to work. Sharanagouda: If I come alone (switch to the BJP) will it have any effect… I don’t know if it will be a problem. I am quite scared about that. BSY: See, there are two things you need to understand. Since you are already looking after everything, you come to Bombay (Mumbai). Dr Sudhakar also joined our group in Bombay yesterday. He left in the morning and has joined us there. Two more people will leave after the assembly tomorrow. So if you and the other two people join tomorrow, it will be 13-14 people. We will need maybe one more person. We will not promise those people minister posts or anything. Also, understand when I tell you that there is no one there, there is no one now, got it? Which is good for you. It is a good opportunity for you. Leave everything to me. I will take care of you like my son. If I promise something in my life, I will make sure I uphold it. Don’t worry too much, leave everything to me and go. In my life, after I promise things to someone I do not backtrack or cheat people. We will give you money for the elections all of that we will take care of. Shivangouda Naik: We will speak to Vijayanna (B.Y. Vijayendra, Yeddyurappa’s son) about all these things. BSY: Vijayendra is also there (Mumbai). 99 per cent our number will touch 14 to 15 soon. Shivangouda Naik: We will be surprised if it is around 20. Sharanagouda: Sir, these guys keep telling me about my father losing his membership. It will become difficult if he loses his membership at this age. I don’t want to cause him trouble at this age. BSY: All of these people, Siddaramaiah and the rest have been saying things like that; they have no guts. For the past three days, he (Siddaramaiah) has been blabbering things like we will cancel memberships. Does anybody care about the whip or the disqualification? Tomorrow, our number will touch 11, nothing is going to happen to them. Shivangouda Naik: You need to think about the fact that a Veerashaiva CM will be a historical decision. Who is this Kumaranna (CM Kumaraswamy) and Siddaramaiah? They don’t belong to your community. You will enjoy this credit all your life. Shivangouda Naik: For us, we want a Lingayat. It will be a credit to us. Sharanagouda: What we are worried about is that people say that we may also be disqualified like the 16 MLAs were during the BJP regime. Shivangouda Naik: That was a different issue. From now on, Yeddyurappa will take responsibility for everything that happens as he is a man of commitment. BSY: Eh, nothing like that will happen. BSY: That incident is different. He is talking about disqualification. Nothing like that will happen. Shivangouda Naik: Listen Sharanagouda, if sir promises you something, it is like it has been set in stone. He will take care of everything. When I wanted to be a political secretary, he got it done. He will take care of you. You need to be brave and he is very committed. Shivangouda Naik: Your constituency work also will be done by us. Sir, all of the work in his father’s constituency is done by him. He has taken on five zillas himself. He is very good. We don’t have to support someone like Rajvir. There won’t be problems like that. He has the capacity to do it alone sir. Shivangouda Naik: Sir, his father wins because of him. He has good organisational capacity. We can make him a minister. He will do something and convince his father, sir, he will do it. Together, now Raghavendra, Vijayendra and Sharanagouda are like your sons. It will be done, sir. BSY: Once I promise something, I will stand by my word. This is number one. Number 2, you will convince your father and you will come there and see for yourself. You can come see yourself. Sharanagouda: Sir, they have called him for a legislative (party) meeting at 9.30 tomorrow. Shivangouda Naik: Let him attend the meeting. Let your father attend. You come to Bombay and see for yourself and convince your father. Let him give his resignation later. 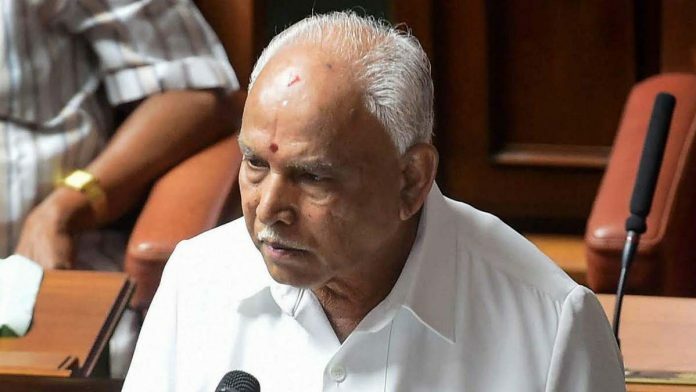 BSY: Let him not come at all. Shivangouda Naik: Yes sir, I will tackle it. Sharanagouda: They don’t trust us, sir. The Congress is like a fort. You know how it is in this constituency. If we take decisions like this, we will need your full support to hold elections. BSY: Definitely. We will. Baburao also has also joined us. It won’t be a problem now. It will be easy. Shivangouda Naik: Sharan, this opportunity for you to become a minister, all this is coming your way because of your previous life’s good deeds. You gather courage. We will support you. Raju and I will come and sit and help you with it… Isn’t that more than enough? Venkat Reddy will also work. We will face the results together. You will become a minister and we will help you get there. I will write it down for you that we will make you win 100 per cent. We will all work together. BSY: We are taking people now. We will make 12 people ministers and around 6-8 of them will be made chairmen. Those who we make ministers, we will help them win elections. We will give them Rs 10 crore each. Sharanagouda: Sir, what about election expenditures? BSY: We will give Rs 10 crore brother. I will treat you like my own son Vijayendra. I will take care of everything in your life. Believe me when I say 100 per cent everything will be taken care of in your life. Don’t waste a second, you just come to Bombay. Shivangouda Naik: Trust in sir. You must trust him. He is a father figure in politics. He is a big man and he will take care of you. BSY: See you have come at the right time. I have finished visiting temples and good things are happening. Don’t fret, just come to Bombay without your father and everything will be ok.
Shivangouda Naik: He will convince his father, sir. BSY: If you come it is enough. Sharanagouda: Sir, they have given a notice today saying action will be taken if MLAs don’t show up. BSY: None of that matters. It won’t be a legal problem. By tomorrow evening you will see that we will have 12-14 people with us. These 10 people include Dr Sudhakar…. 11 others, none of them have got anything so no one cares about it (whip) anymore. Altogether there are 11 people in Bombay now. Sharanagouda: If I come alone will it be a problem? BSY: No, by tomorrow evening there will be 12 of us. BSY: Your father doesn’t have to come. Two things here… First, you come there and then convince your father to resign. Shivangouda Naik: I will come to Bombay with you. Will make sure you get your payments. BSY: You go there tomorrow. Stay there for 16 days and then convince your father to resign later. Shivangouda Naik: You convince your father. After that, we will get you your payments. Sharanagouda: Sir, we come from a middle-class family and we have made our name with our work. We will need your support to win this election. BSY: See, understand that after finalising everything and before naming you as a minister, I will fix Rs 10 crore. Then later we can see what we will do for elections and give you more money. It is our job to make you an MLA. It is your job to convince your father. Sharanagouda: I have nothing against (it) sir. I will trust you but then later it should not be like we are neither here nor there. BSY: As on today, it has been 10-12 days since we started this (revolt) in Bombay. 11 MLAs were there, now two have come back. Dr Sudhakar has reached this morning. Shivangouda Naik: KR Pet MLA Narayana is also there in Mumbai. BSY: Where is the JD(S) today? Will anybody ask where your father is? Shivangouda Naik: The government will fall with the JD(S) at the helm. BSY: You will get a clear idea when you go there. Shivangouda Naik: Also, you think about your future political career. You are young, just 30 years of age. At this age, if you become a minister, you will be making history. BSY: We will not make anyone else the minister from there. It will be only you. I have made a promise, I will do it. After the formalities are done, we will talk about money. Shivangouda Naik: I will talk to Vijayanna (Vijayendra) about it sir. BSY: He has to go and meet Vijayendra there. Shivangouda Naik: Speak to Sahebru (Yeddyurappa) whatever you want to say… When it is confirmed, then I will speak to him. I have been told that the number has already touched 10. Tomorrow, three more are expected to join. We are aiming at gathering 15 MLAs and getting them to resign. Money has already been paid to Speaker Ramesh Kumar to accept resignations as soon as they give it to him. Shivangouda Naik: Yes, Rs 50 crore. Sharanagouda: But I am told that he is in favour of Congress. Shivangouda Naik: He will accept resignations immediately, don’t worry. I will tell you later how it was managed. If the resignations are not accepted, then they will make it a Constitutional crisis and bring in Governor’s rule. The BJP will ensure resignations are accepted through a court ruling. There is no other go but to call for government formation. It has happened at the highest level… At the level of Modi, Amit Shah and the governor. Sharanagouda: This can happen only if they are involved. Shivangouda Naik: Even at the high court and Supreme Court level, Amit Shah has held discussions in case there is any problem from the Speaker… Everything is ready. Power of Electoral Bonds in full display.No wonder Bank frauds in 2017-18 were at over Rs 40K Cr. Why we have second clip desperately.. That is giving doubt.. They should have had continuous clip and in second slip speaker name came and looks like it is fabricated after some minutes… I am not saying complete clips are issue.Looks like first one genuine and second one added.. They will sell their wives and daughters for power they are so desperate they have no shame to enjoy anybody’s lollipop. BJP is desperate and can do anything to grab the power. These crores of money they want to distribute came through election funding which corporate from Banks as loan. Later many of them will default and go for bankruptcy. At the end taxpayers money will be used like this….. So you are saying that congress never indulged in horse trading? If you are thinking that way let me tell you Congress was THE party that started it since they have ruled in MOST states and the country. That is how they defeated everyone. They are being paid back in the same coin but here you are acting holier than thou. Actually, all this seems more funny than serious. It does seem that this boy Sharan was a plant, who did the recording. One does not know why the BJP should indulge in all this.